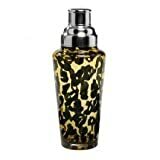 The Leopard Print Martini Shaker is made from hand crafted glass and includes a stainless steel strainer and lid top. Able to handle 25 Fl. Oz of your favorite cocktail, this martini shaker is sure to shake up every party! Wild Eye, our original Brand, has over 300 different Wine, Bar, Tabletop, and Kitchen products. From elegant serving pieces to fabulous wine caddies, Wild Eye has everything you need to bring your style to the table.